Hey Everyone! Hope you are all well and having the best start to 2017. 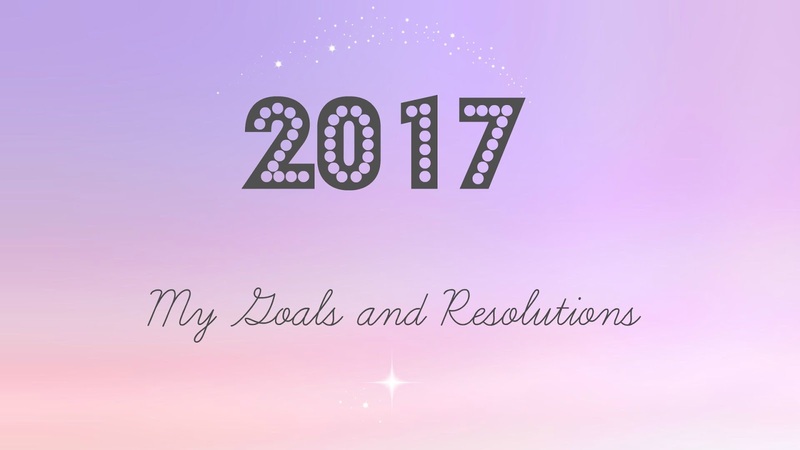 Following on from my 2016 round up post I thought that today would be the day I speak about my goals and resolutions for the rest of 2017. It took me quite a long time to think of what my resolutions would be as I originally wanted to get this post up on the first day of the year but I wanted my resolutions to be more meaningful than 'quit chocolate' or 'exercise more' so I've come up with this list of resolutions that I believe I will stick to throughout this year. I have split this into two parts, personal and blogging. Hope you enjoy this post. I know a lot of people don't see the point in setting personal goals but for me I think it's great to set at least a few to work towards as it's something that can help better yourself. 2016 is now over and 2017 is now a completely clean and new canvas. I've set myself a few goals that aren't too major or unrealistic and I'm super excited to see what I can do with these over the course of the next 12 months. As positive as I try to be most of the time I do let negativity get the better of me and there are times when I just cannot see light at the end of the tunnel so I end up thinking extremely negatively and even though this is definitely something I improved on in 2016 I want to throw all negativity out the window. So far I think I have done pretty well but we are only 7 days in. Still a while to go yet. Ever since I was little I have loved travelling. Travel has become a such huge passion of mine that I even studied it to degree level and I am lucky enough to work in the industry. I have been lucky enough to visit countries such as Spain, France, Turkey, Mauritius and Germany in the past few years however now I really want to branch out and visit the US and Canada and even Australia. If you read my 'What I Got For Christmas' post then you will know one of my closest friends got me a book titled '501 Must Visit Cities'. It's definitely something I am going to start working my way through. I'm excited to see more of the world this year even if it does mean travelling by myself. I think it'll be a great way to meet new people and make new friends. Of course I am a little nervous but I'm also extremely excited. As well as relearning the violin something I want to learn is a new language. I haven't decided which yet but working in an airport means that I come across hundreds of people everyday, some of which can't speak English and I just think learning a new language even if it's just the basics can really help me job wise. If anyone knows any good apps, sites or platforms to learn a new language please let me know below. This is something that has been on my resolutions post for the past 2/3 years which I know might seem bad to some of you but I haven't had the best luck with instructors or I have had really bad confidence and not just been comfortable enough learning. However, I have finally booked a lesson for a couple days time and I am excited to finally get into it and hopefully pass my test and have my license in no more than a couple months time. I already have a car so once I've passed my test I'm sorted. I'm the type of person that says yes to everything. I try to please everyone and sometimes I end up really suffering because of it. I don't have time for myself anymore and it's something I really have to change so in 2017 I will learn to say no more often. I don't want to disappoint anyone but there comes a time where you have to put yourself first and that is something I'm going to do as much of in 2017. Last year I lost my cousin to cervical cancer. I knew a few people who lost loved ones to cancer and a close friend of mine has recently been diagnosed as well. It just really puts life into perspective and has helped me realise how much I want to help other people. Not only is it going to be helping others but it's also extremely rewarding. I'd really like to fundraise and help set different things up to help cancer charities but also children's charities. Children In Need is something I've wanted to help with for ages and I hope 2017 is the year I can finally do that. 2016 was definitely my most disappointing year in blogging. I just didn't post as much as I would like, I didn't have much motivation and I just felt like my blog is lost in a sea of thousands of incredible blogs. 2017 is hopefully going to be a much better year and in order for that to happen I have set four blogging goals that I hope can be achieved. Photography has never been that great on my blog and it's definitely something I hope to improve on in 2016. I love taking photos. I'm always on instagram and snapchat and I am really hoping to experiment more with different lighting and angles in 2017. If there is one thing I dislike about my blog it's the name. Even though it is my actual name I don't actually like it as a blog name. I feel like I need something that shows off my personality a little bit more. I've wanted to change my blog name for the past 2 years so again I hope it's something I eventually get around too in 2017. Every time I publish a post I get extremely worried and get worried about the reaction. I always stick to certain topics that I know will do well and never really post about what I want to post about. 2017 will be the year I step out of my comfort zone and write about anything I want to write about. If I want to put a fashion post up I will do it, if I want to write about music I will write about music, if I feel like writing about travel I will do it. 2017 will definitely be the year of more varied content on my blog. My blog is my blog. Even though a lot of us bloggers post about similar topics we all have different views and opinions. We all have different writing styles and we all have different ways of getting a point across. It took me a long time to realise and accept this. I will stop comparing myself to other bloggers. So what if their post gets more views than mine? It doesn't mean I'm a rubbish blogger. I definitely put way to much pressure on myself and I think that's what took the enjoyment out of it for me in 2016. 2017 is definitely the year I stop all this and start to love blogging again. Phew, well that's it. This post is definitely longer than I expected it to be and was definitely very rambly but I absolutely loved writing it. If you go to the end of this post then thank you. I hope you enjoyed reading all about my goals and resolutions for 2017. I am excited to get to the end of the year and look back on this post to see if I managed to achieve everything I wanted to achieve. Be sure to let me know if you have any similar goals and resolutions in the comments below. What is one thing you really want to achieve in 2017? Have you got anything special on the list?